“My friends, love is better than anger. Hope is better than fear. Optimism is better than despair. Update 03/10/2013: Read news that CBC will be airing a biopic Smilin’ Jack: The Jack Layton Story. It seems like I’ve posted a dozen times today around the web about how great a man Jack was. And yet a thousands posts can not do him justice. He was a friend to LGBT people long before it was cool, he never lost sight of his ideals while recognizing the real limits of the political system in which he swam and he earned my respect. His final letter reminds me in some ways of Ted Kennedy; although in his very own Canadian way. Due to being laid off, 2008 was my most recent trip back to Toronto for their annual Pride celebration. Above is a photograph I took of Jack marching in that year’s Pride Parade as he had done for years. He is riding a tandem bike with his wife in the other seat. 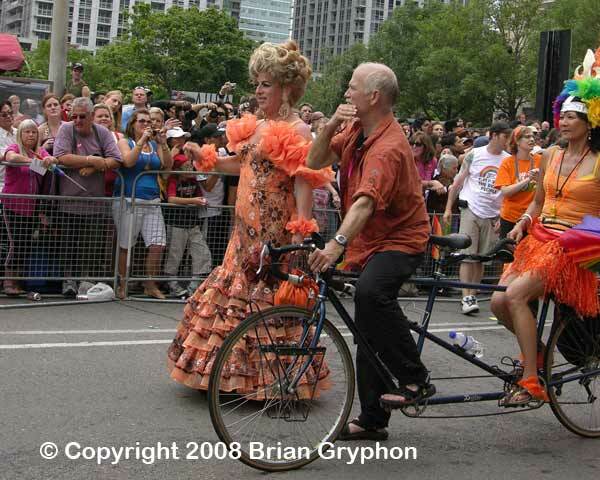 They, and the drag queen marching beside him, are wearing orange; the trademark colour of the New Democratic Party (NDP). Jack was a long-time member of that party; he rose from member of city council to national Leader of the NDP. Sadly it seems like only yesterday his party won the second-largest number of seats and he became the Leader of Her Majesty’s Loyal Opposition. It was the hope of many Canadians that he and the party would be a brake on the worst excesses of the Conservative Party. It is now our fear that no one can replace him. 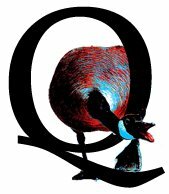 Visit this site for the complete text of Jack’s final letter to Canadians. To read more about this great man, please visit the Toronto Star web-site. For a very Canadian appreciation, check out this Air Farce clip (HT: Sean Martin).